By focusing on the human side as well as the intellectual dimensions of how economists work and think, this collection of interviews with top economists of the 20th century becomes a startling and lively introduction to the modern world of macroeconomics. A fun read! For more information, frequent updates, and to comment on the forthcoming book, visit William A. Barnett's weblog at http://economistmind.blogspot.com/. "In candid interviews, these great economists prove to be fabulous story tellers of their lives and times. Unendingly gripping for insiders, this book should also help non-specialists understand how economists think." Professor Julio Rotemberg, Harvard University Business School, and Editor, Review of Economics and Statistics. "Economics used to be called the 'dismal science'. It will be impossible for anybody to hold that view anymore ... This is science with flesh and blood, and a lot of fascinating stories that you will find nowhere else." "This book provides a rare and intriguing view of the personal and professional lives of leading economists ... It is like A Beautiful Mind, scaled by a factor of 16 [the number of interviews in the book]." " ... if you want an insider view of how economics has been developing in the last decades, this is the (only) book for you." "Here we see the HUMAN side of path-breaking research, the personalities and pitfalls, the DRAMA behind the science." Paul A. Samuelson is Professor Emeritus of Economics and Institute Professor Emeritus at the Massachusetts Institute of Technology. In 1970 he became the first American to win the Nobel Prize in Economics. His landmark 1947 book, Foundations of Economic Analysis, based upon his Ph.D. dissertation at Harvard University, established him as “the economists’ economist” by raising the standards of the entire profession. Paul Samuelson's classic textbook, Economics, first published in 1948, is among the most successful textbooks ever published in the field. William A. Barnett is Oswald Distinguished Professor of Macroeconomics at the University of Kansas. He is Editor of the monograph series International Symposia in Economic Theory and Econometrics, and Editor of the journal, Macroeconomic Dynamics. He has published 17 books and over 130 articles in professional journals. Coeditor's Foreword: Reflections on How Biographies of Individual Scholars Can Relate to a Science's Biography (Paul A. Samuelson). Coeditor's Preface: An Overview of the Objectives and Contents of the Volume (William A. Barnett). 1. An Interview with Wassily Leontief (Interviewed by Duncan K. Foley). 2. An Interview with David Cass (Interviewed jointly by Stephen E. Spear and Randall Wright). 3. An Interview with Robert E. Lucas, Jr. (Interviewed by Bennett T. McCallum). 4. An Interview with János Kornai (Interviewed by Olivier Blanchard). 5. An Interview with Franco Modigliani (Interviewed by William A. Barnett and Robert Solow). 6. An Interview with Milton Friedman (Interviewed by John B. Taylor). 7. An Interview with Paul A. Samuelson (Interviewed by William A. Barnett). 8. An Interview with Paul A. Volcker (Interviewed by Perry Mehrling). 9. An Interview with Martin Feldstein (Interviewed by James M. Poterba). 10. An Interview with Christopher A. Sims (Interviewed by Lars Peter Hansen). 11. An Interview with Robert J. Shiller (Interviewed by John Y. Campbell). 12. An Interview with Stanley Fischer (Interviewed by Olivier Blanchard). 13. An Interview with Jacques Drèze (Interviewed by Pierre Dehez and Omar Licandro). 14. An Interview with Thomas J. Sargent (Interviewed by George W. Evans and Seppo Honkapohja). 15. An Interview with Robert Auman (Interviewed by Sergiu Hart). 16. Conversations with James Tobin and Robert Shiller on the "Yale Tradition" in Macroeconomics (Conducted by David Colander). Inside the Economist's Mind is a very rare thing--an economic page-turner. The personalities behind the frontiers of economic research make for compelling reading. I cannot recommend it highly enough. 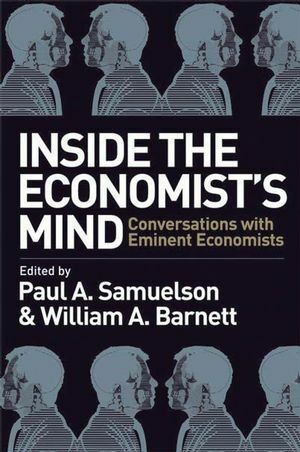 "A wonderful collection of personal and professional insights by Economics' leading intellectuals. Each one is worth reading." "In candid interviews, these great economists prove to be fabulous storytellers of their lives and times. Unendingly gripping for insiders, this book should also help non-specialists understand how economists think." "The interviews in this volume are unique intellectual documents in the history of economic thought, economic policy, and biography. Scholars will value them as primary sources. Readers with only a passing interest in economics will be delighted by their entertaining insights into the minds and lives of these great thinkers. This is one of the most valuable projects in academic economic publishing for a long time, and we should all be grateful to the journal, Macroeconomic Dynamics, for collecting these archival treasures over a number of years." "Economics has made swift progress in the past few decades and its role in policy-making has radically increased. The interviews of many of the most prominent researchers and policy-makers offer a unique insider view of these developments. This book is fascinating reading to anyone interested in contemporary economics and its role in modern societies." "Economics used to be called the 'dismal science'. It will be impossible for anybody to hold that view anymore after reading these interviews. This is science with flesh and blood, and a lot of fascinating stories that you will find nowhere else." "This book provides a rare and intriguing view of the personal and professional lives of leading economists, and the circumstances that facilitated their creative breathroughs. It is like A Beautiful Mind, scaled by a factor of 16 [the number of interviews in the book]." "Histories of economic analysis abound, but if you want an insider view of how economics has been developing in the last decades, this is the (only) book for you." Includes an introduction by the editors, as well as concluding essays by prominent economic historians.